Beautiful leather foal show halter with crystal browband. Make sure your foal looks it's best at the inspection or when showing to potential buyers. The browband with 3 rows of crystals sparkles and gives an elegant look. The show halter is more fitted than a normal halter which makes for a more elegant and organised look. Adjustable to fit all ages of warmblood foals. 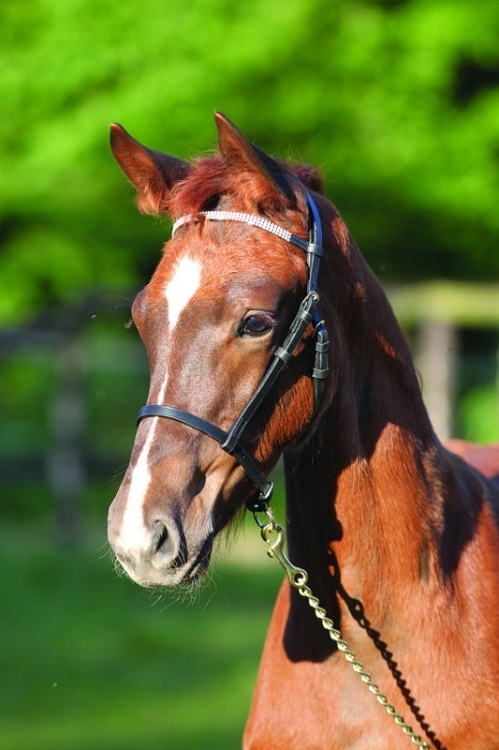 If you want mare and foal to match, then check out the Leather Show Bridle. It's hard to say without having seen the yearling, but as this is made for warmblood foals, it may be too small, yours being a yearling. You are of course welcome to order one and try it on, and if it doesn't fit, return for a refund. Q: What is the browband made of? The browband is leather with 3 rows of small sparkly crystals. I keep them in stock during the show season (July-September). Apart from that I have to order them from Europe, so it can take a couple of weeks.